The Hotel Villa Garden has only 19 rooms, with white painted walls and large windows or balconies overlooking the Bay of Naples. Rooms are furnished in a simple and cozy style, to make you feel at home. The 3 Patio rooms are located at the ground floor of the villa and are about 20 square meters each. They are very bright and cozy and all provided with a terrace equipped with table and chairs. Patio rooms are available also in triple e quadruple configuration. The 6 Classic rooms are located on the first or second floor of the villa and are about 20 square meters each. They are very comfortable and all provided with a large side sea view window. The 4 Superior rooms are located on the first or second floor of the villa and are about 20 square meters each. They are very cozy and bright and all provided with side sea view balcony or terrace, equipped with table and chairs. The 2 Deluxe rooms are located on the first or second floor of the villa and are about 20 square meters each. 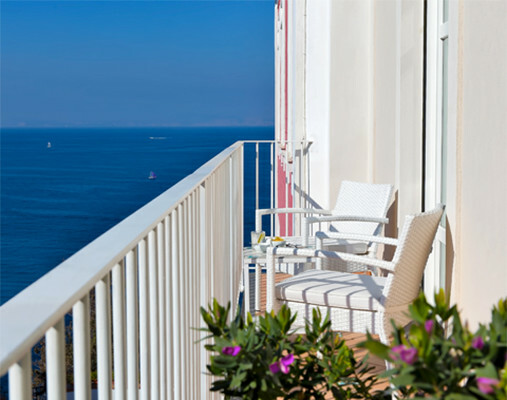 They are very romantic and all provided with equipped balcony or terrace overlooking the Bay of Naples. The 4 Junior Suite are located on the first or second floor of the villa and are about 35 square meters each. They are very romantic and comfortable and are all provided with large windows overlooking the Bay of Naples. The Junior Suites are very spacious and are available also in triple and quadruple configuration. Above rates are per room per day and include service and american buffet breakfast, city tax not included. Our reservation office is open every day during the summertime from 08:00 to 9:00 pm. During the winter time from 09:00 to 1:00 pm.